452 ND Fighter Day Squadron - The 452FDS was assigned to the 322FDW based at Foster AFB,Texas under the Command of Col.C.Talbott. The Squadron was equipped with F-100C's. Won the Bendix Air Race in 1955. Took part in the Jamestown Celebrations in 1957 (details attached). Three aircraft named after the three ships which sailed the Atlantic in 1606, by Dignitaries in London. PBasic shipping included to most countries. Additional costs may incur for EURO, South America and African countries. Based at Bunker Hill AFB, Indiana during 1956-1957 and it was equipped with F-86F,s and then F-100,s. It had a relatively short career and was disbanded in 1957. Basic shipping included to most countries. Additional costs may incur for EURO, South America and African countries. 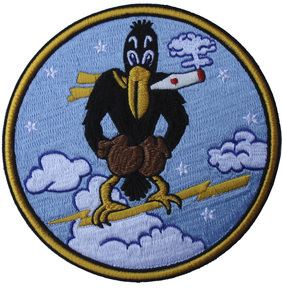 The 456th Bomb Group was formed May 14, 1943. On June 1, 1943, the 456th Bombardment Group (H) was activated, along with it's four squadrons, at Wendover Army Air Field, Wendover Utah. Thanks to www.jbmilart.com for the information. The 463rd was known as the "The Swoose Group" because its Group Commander, Col. Frank Kurtz, had named his aircraft "The Swoose". He carried that name forward from a B-17D that he flew in the Pacific prior to being named Group Commander of the 463rd. Thanks to www.463rd.org for the information. This patch is a modern replica of the "Gentlemen from Hell" patch that was worn by some of the original crew of the 487th Bomb Group (H). 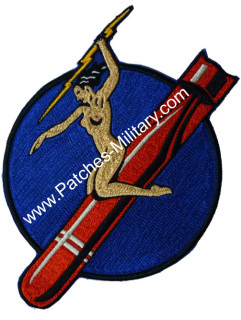 The re-discovery of the patch occurred because of the work of Bob Jacobs, son of Jimmy Jacobs (navigator with the 836th squadron). Thanks to www.487thbg.org for the information.